1 — Gabbard will definitely be the most antiwar candidate on the debate stage by a wide margin, except in the highly unlikely event that someone steps up from way out of left field to run like Dennis Kucinich. Being the most antiwar candidate in anything associated with the Democratic Party is a very low bar, but her vocal positions on Syria, Iran, Yemen, Russia, North Korea, Afghanistan, Gaza, and previous US regime change interventions set her so far from the establishment orthodoxy that she’ll look as different from the other candidates as Ron Paul looked on the Republican debate stage. 2 — Make no mistake, it is this opposition to significant aspects of the US war machine that is the driving force behind the overwhelming bulk of the shrieking objection to Gabbard’s candidacy, not any of the more valid criticisms. We have learned from the mainstream acceptance of Bernie Sanders and Alexandria Ocasio-Cortez that some criticism of the status quo will be tolerated when it comes to domestic policy, but it’s an excommunicable offense when it comes to foreign policy. The idea that the US should forcefully control world affairs using the carrot of alliance and the stick of military violence is so ubiquitous in both of America’s mainstream parties that it takes a Washington Post columnist getting dismembered alive to start a debate about something so self-evidently evil as the Saudi-led destruction of Yemen. 3 — Foreign policy is undeniably the area in which the greater part of US government depravity takes place, and as far as America’s permanent government is concerned it is by far the most important. Forcing a debate on an issue you’re not even supposed to bring up on mainstream media will get a lot of ordinary Americans asking questions that very powerful individuals don’t want asked. The DNC went from scheduling over 20 debates in 2008 to trying to limit it to six in 2016 because they didn’t want Sanders’ excellent domestic policy ideas getting out to the public and making their coronated status quo candidate look bad. Gabbard could have the same impact on foreign policy in an audience that has been aggressively propagandized by MSNBC warmongering. 4 — Gabbard’s progressive positions on issues like Medicare for All, environmentalism, $15 minimum wage, Wall Street accountability, the failed war on drugs, marijuana legalization, criminal justice reform and indigenous water rights will also set her further to the left on domestic policy than anyone on the debate stage besides Sanders should he run. This is a self-evident fact, but a lot of narrative control efforts are being poured into painting her as a right-winger. She will definitely help force the debate to the left, and her position on withdrawing from expensive interventionist war policies answers the “But how are you going to PAY for it? ?” questions the MSM talking heads are so fond of grilling progressives with on social programs. 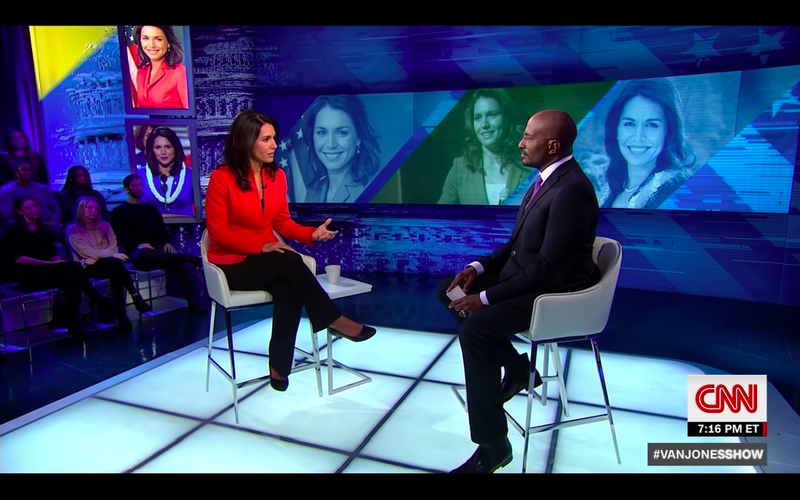 5 — For me the most telling thing about Gabbard is the way she resigned from her position as vice chair of the DNC in order to endorse Bernie Sanders in 2016. Other DNC operatives remained inside the Committee and actively schemed to give Clinton every unfair advantage in the primary, but Gabbard showed integrity and refused to advance a biased agenda in violation of the DNC charter. It showed that she’s a real person operating within one of the phoniest places in the world, and that she’s willing to throw a spanner in the works of the machine when it’s in the highest interest. This unwillingness to march to the beat of the establishment drum for such proceedings could lead to some very interesting things as the presidential race heats up.